For demonstrating the principle of the parallelogram law of forces and polygon of forces. a unit is a drawing board size: 75 x 60 cm fitted on two side pillars for standing. the board is supplied complete with two pulleys (clamp pattern) 3 x 50 gm hangers and 12 slotted weight of 50 gm, reel of cotton thread and a ring. This consists of machined aluminium table 40 cm. in diameter. Its raised rim has a scale, graduated in 360 degree, mounted on vertical support rod based provided with levelling screws. 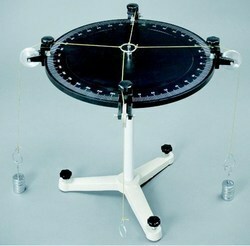 Body under study is a ring in center of the table fastened by cords passing over four pulleys, attached with the table. - Table Size: 40 mm Dia. 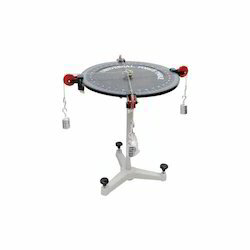 We offer Universal Force Table with Brass Slotted Weight which is well-known for its specific functionality and quality. Our offered product has faultless finish and is highly demanded in the market. Apart from this, this product undergoes stern quality checking under the command of our nimble industry professionals.